William Nuschler "Will" Clark, Jr. (born March 13, 1964) is a former first baseman in Major League Baseball best known for his years with the San Francisco Giants from 1986 to 1993. Clark was known by the nickname of "Will the Thrill." The nickname has often been truncated to simply, "The Thrill." After a sensational career at Jesuit High School in New Orleans, Clark attended Mississippi State University, where he continued to flourish. Clark was inducted into the Mississippi State University Hall of Fame in 2003. Clark was inducted into the College Baseball Hall of Fame in 2006. He was inducted into the Bay Area Sports Hall of Fame on April 26, 2007 and the Mississippi Sports Hall of Fame on August 1, 2008. He currently works in the San Francisco Giants front office after spending five seasons as an advisor for the Arizona Diamondbacks. Playing for Mississippi State University, Clark was noted for his oft-imitated "sweet swing," said to be among the best in baseball. In 1985, The Sporting News named Clark an All-American and he later won the Golden Spikes Award from USA Baseball. A teammate of Rafael Palmeiro, the two were known as "Thunder and Lightning". Clark and Palmeiro were known to dislike each other, dating back to their time at Mississippi State. Clark was drafted with the second overall pick in the 1985 Major League Baseball Draft by the San Francisco Giants. In his inaugural major league at-bat on April 8, 1986, Clark debuted with a home run—off future Hall of Fame member Nolan Ryan. A few days later, Clark also homered in his first home game at Candlestick Park (he debuted at age 22, wearing the number 22, playing first base). An elbow injury cost Clark 47 games in his rookie season. Clark finished his rookie year with a respectable .287 batting average. 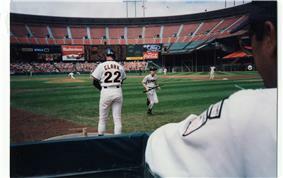 Clark prepares to bat during a 1992 game at Candlestick Park. Over the next six seasons, Clark would establish himself as the premier first baseman in the National League. In his first full season in 1987, Clark had a .308 batting average. Clark was voted the starting first baseman for the NL All-Star team every season from 1988 through 1992. In 1988, Clark was the first Giants' player to drive in 90 or more runs in consecutive seasons since Bobby Murcer from 1975-1976. His finest season was in 1989, when he batted .333 (losing the batting title to Tony Gwynn on the final day of the season) with 111 RBI. Clark finished second in the NL Most Valuable Player voting to Giants teammate Kevin Mitchell. In Game 5 of the series, Clark faced Cubs closer Mitch Williams with the score 1-1 in the bottom of the eighth inning. After an epic at-bat, with several two-strike foul balls keeping the duel alive for several minutes, Clark singled to center field to drive in two runs, breaking the tie, eventually sending the Giants to the World Series. Clark's efforts, which included a .650 batting average and two home runs, resulted in him being named NLCS MVP. The Giants went on to face the Oakland Athletics in the 1989 World Series, but were swept. In the only World Series appearance of his career, Clark failed to contribute significantly at the plate, finishing with no runs batted in and a .250 batting average while battling tonsillitis. Clark had become a very durable player since his rookie year injury, setting a San Francisco record with 320 consecutive games played from September 1987 through August 1989. However, a string of injuries reduced his playing time in the early 1990s and diminished his production. Clark drove in just 73 runs in 1992, the lowest total since his rookie year. Clark's contract with the Giants expired after the 1993 season. The Texas Rangers signed Clark to replace his former Mississippi State teammate, Rafael Palmeiro, at first base. Clark made the American League All-Star team in 1994 and finished the season with a .329 batting average, the second-highest of his career. He maintained a high level of offensive production throughout his tenure with Texas, finishing below .300 only in 1996. 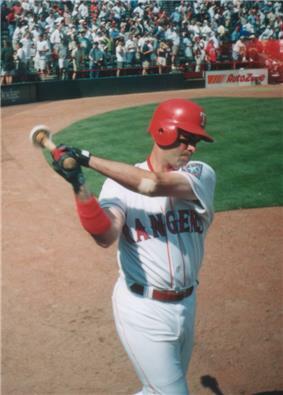 Injuries limited his playing time to 123, 117 and 110 games from 1995 through 1997, but Clark led the Rangers to American League West Division Titles in 1996 and 1998. Clark struggled offensively in both the 1996 and 1998 postseasons, though he put together his most productive regular season in seven years in 1998 (.305, 23 HRs, 41 2Bs, 102 RBIs). Following the 1998 season, the Rangers re-signed Rafael Palmeiro, effectively ending Clark's days with the team. Clark responded by signing a two-year deal with the Orioles, once again replacing Palmeiro at first base. Clark joined the Orioles for the 1999 season, again replacing Palmeiro, who had left Baltimore to return to Texas. Clark spent nearly two years with Baltimore but was plagued by injuries. On June 15, Clark got his 2000th hit versus the Kansas City Royals. Clark was traded to the St. Louis Cardinals near the end of the 2000 season, acquired in part to play in place of the injured Mark McGwire. A rejuvenated Clark (.964 OPS) helped the Cardinals defeat the Atlanta Braves in the NLDS. In the NLCS, the Cardinals faced the New York Mets, who would go on to win the pennant. Clark performed better in these playoffs. After announcing that his retirement would come when the Cardinals' playoff run ended, Clark went 1 for 3 in his final game on October 16, 2000. Clark was inducted into the College Baseball Hall of Fame in 2006. He was inducted into the Bay Area Sports Hall of Fame on April 26, 2007 and the Mississippi Sports Hall of Fame on August 1, 2008. Clark has final statistics of 284 home runs, 1205 RBI, a .303 batting average, and a .881 OPS. In 2006 Hall of Fame balloting, Clark received 23 votes, 4.4% of the total, which withdrew him from consideration from future ballots, as he did not receive the required 5% threshold to stay on. Two-time National League Silver Slugger Award at First base (1989 and 1991). 1991 National League Gold Glove Award at First Base. On July 4, 2006, Clark was inducted into the College Baseball Hall of Fame in its inaugural class. Inducted into the Mississippi Sports Hall of Fame in 2008. ^ a b "Hall of Fame Inductees (2007)". Bay Area Sports Hall of Fame. ^ a b FitzGerald, Tom (27 April 2007). "New inductees remember / Rice, ex-Giant Clark among those recalling their finest hours". San Francisco Chronicle. ^ Chris Haft (January 28, 2009). "Giants add Clark with front-office post 'The Thrill' played in San Francisco for eight seasons". ^ "Giants hire Will Clark as assistant". Yahoo! Sports. January 28, 2009. Retrieved January 12, 2013. ^ Chass, Murray (9 March 1994). "BASEBALL; Thoughts Deep in the Heart of Texas". ^ "Raspy, Feverish, Will Clark Skips Batting Practice". Los Angeles Times. October 16, 1989.